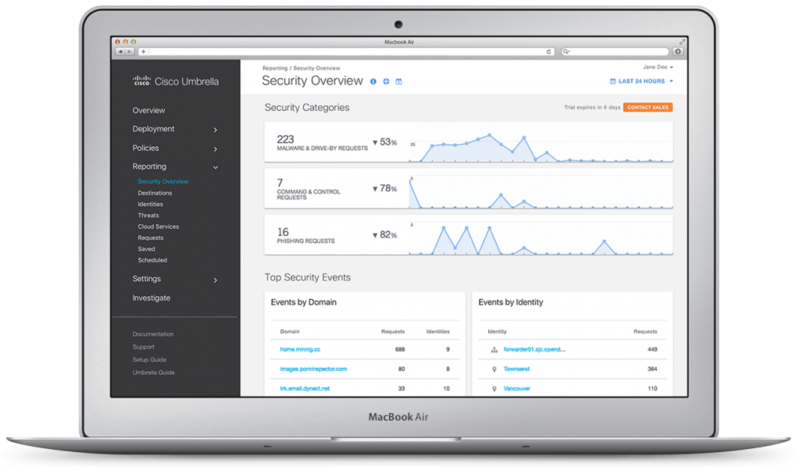 Cisco Umbrella is a cloud security platform that provides the first line of defense against threats on the internet — wherever users go. By learning from internet activity patterns, Umbrella automatically uncovers current and emerging threats, all without disrupting your network. And because it’s built into the foundation of the internet and delivered from the cloud, Umbrella is the simplest security product to deploy and delivers powerful, effective protection. No credit card or phone call required. Weekly security report — get a personalized summary of malicious requests & more, directly to your inbox. 1,000+ users? — You’re eligible for the Umbrella Security Report, a detailed post-trial analysis.